I remember liking wooden decking flooring so much, I had them installed inside my house, by the window. Nope, there wasn’t a balcony, but that wasn’t gonna stop me. Back then, I chose Chengal Wood. For lack of knowledge and choices, I suppose. What happened after 1 year, was that the wood started cracking, and I was none the wiser. Fast forward to today, when I work with our team of outdoor flooring specialists at Absolut Outdoors. These decking specialists（头手）, with their years of experience, patiently educated me on the types of wooden decking popular with Singaporeans, and I finally figured out why my Chengal timber deck may have cracked. Chengal wood is generally more affordable than other natural timber flooring and is quite commonly available. It originates from Malaysia and is a well-known tropical hardwood for outdoor decking over the years. lt is durable and highly resistant to termite infestation and fungi attacks. An interesting characteristic of Chengal is the small pin-holes caused by ambrosia beetles boring into the living trees. Illegal loggers have been said to be chopping down young immature Chengal trees. We aren’t able to verify this statement though. The problem with using these young immature Chengal trees as decking flooring is that they tend to contain a lot of moisture. 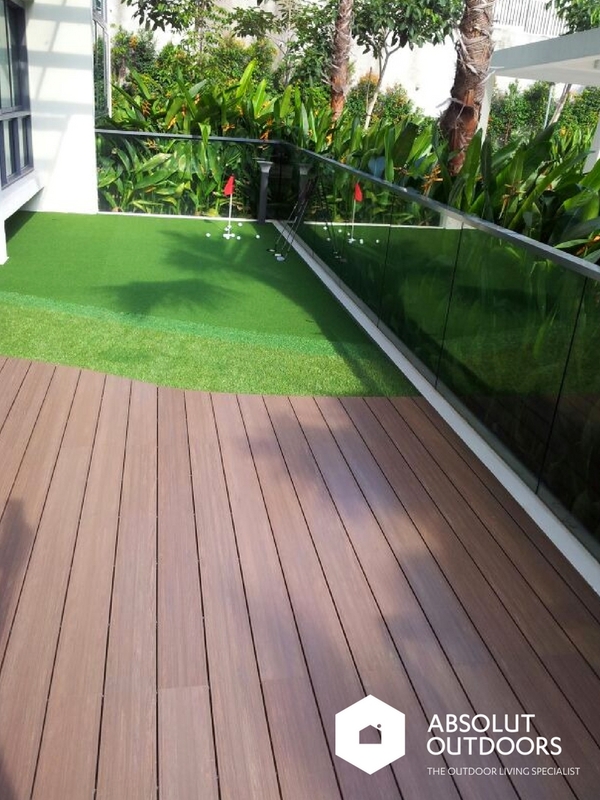 Using them as wooden decking in a hot and humid country like Singapore can result in uneven expansion and contraction. As a result, they tend to crack on the surface if not well-maintained. And since I didn’t do any maintenance on my Chengal wood flooring, it was really no wonder it cracked. Proper maintenance includes sanding and re-varnishing annually. So I guess using mature Chengal wood decking decreases the chances of cracked decking, but you can’t shun away from maintaining your decking regularly. Ironwood is a collective term used to describe woods that are really hard. They are very dense, and are considered by builders to be one of the most stable wood. Their dense nature means that they don’t take stains very well, and stained Ironwood Decking flooring may appear unevenly coloured. I personally don’t see this as a disadvantage though. The beauty of natural wood is enhanced by such perceived imperfections, I think. Ironwood is, however, prone to hairline cracks and need regular maintenance to keep up their beauty. After being processed and kiln dried, Teak wood has been proven to be the only wood in the world with the least amount of shrinking and expanding movements. This unique feature, coupled with its moderate to high hardness means that it tends to have much lesser cracks upon outdoor weathering exposure. 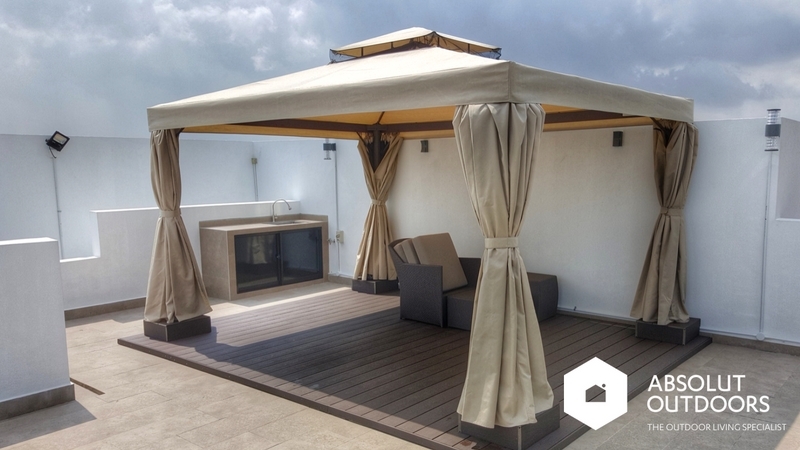 Despite its moderate high hardness, it still has adequate amount of resilience to withstand impact, weight and falling objects, all necessary properties for good timber decking. Solid Teak wood feels great to the touch and it emits a very unique and fragrant smell purported to calm nerves and release stress. Genuine Asian solid Teak wood secretes a particular natural oil that contains a form of iron composition known to repel snakes, insects, mice and termites. This oil allows the wood to age nicely. That’s why Teak is often used in furniture as well. You can roughly tell if a Teak wood is obtained from a mature teak tree by looking at the many micro pin holes on the intersection side. These pin holes are the reason behind the strength and tenacity of Teak wood as compared to all the other woods in the market. Composite wood, also known as Wood Plastic Composite (WPC) is made by thoroughly mixing ground wood particles and heated thermoplastic (eg. PE, PP) resin. The mixture is then extruded into whatever shape desired. Composite Wood Decking can be hollow or solid. There are pros and cons for each. But we’ve found that a solid profile Composite Wood decking can withstand more load. So if you are heavy have heavy furniture, you may want to consider a solid profile WPC decking. Improvements to Composite Wood decking means that later-generation Composite Decking are stronger and more durable. 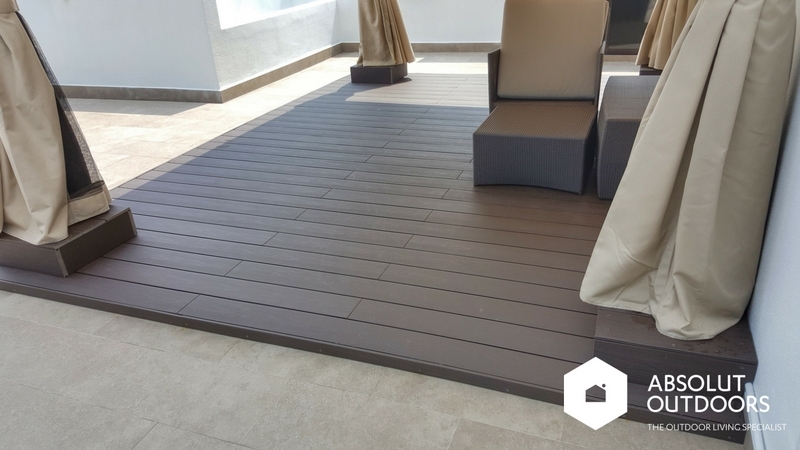 More and more of these Wood Plastic Composite Decking are also labelled as being eco-friendly as they make use of recycled plastic and wood powder or chips left over from other uses that would otherwise have become waste. 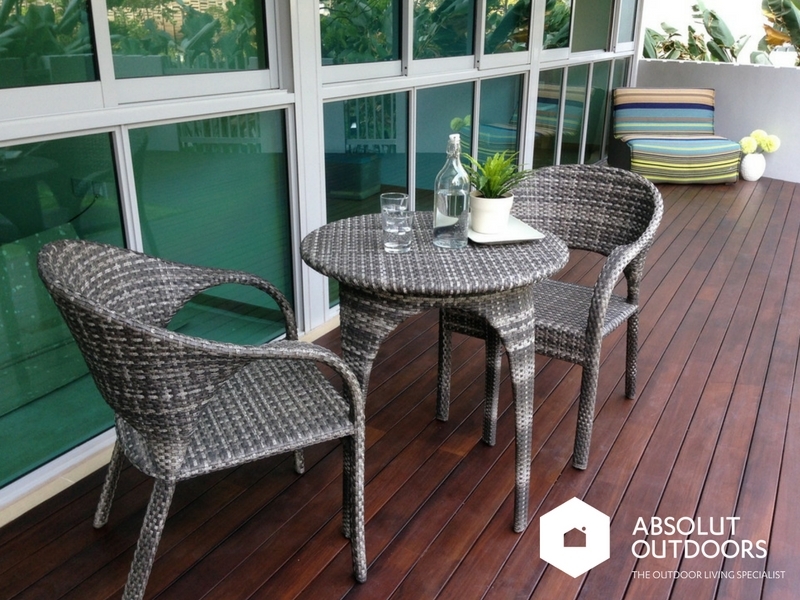 For example, Absolut Wood, Absolut Outdoors’ version of an eco-friendly WPC, is scratch-resistant, stain-resistant, doesn’t rot and splinter-free. It’s also really durable and easy to maintain by simple vacuuming and mopping. So really, given my housekeeping and maintenance (or lack of) inclination, I should have chosen Wood Plastic Composite decking. I hope this helps you select the type of wooden flooring you want for your balcony, garden, patio or roof terrace. You can also visit our product pages here and here to check out our selection of Natural Decking and Composite Decking.